The steps for the reversal of developmental aging in human cells.Genes normally active only in immortal reproductive (gem) cells are introduced into mortal adult body (somatic) cells. These genes reset the clock of cellular aging in adult cells, restoring their ability to differentiate into all human cell types-normally a property of embryonic (stem) cells. This opens the door to the new field of regenerative medicine: a method for generating embryonic cells of all types to repair the aged human body. While stem cells have worked wonders in medicinal research, showing signs of curing everything from spinal cord injuries to blindness, they’ve always had their shortcomings. But one study is promising a new “game changing” technique for stem cells. Taking their cue from salamander regeneration, new research led by the University of New South Wales says that a stem cell therapy capable of regenerating any human tissue damaged by injury, disease, or aging could be available within a few years, through an innovative new technique. 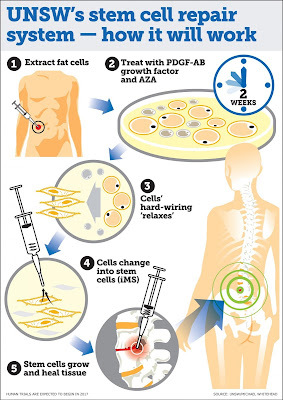 The technique involves reprogramming bone and fat cells into “induced multipotent stem cells” (iMS). These cells are special in that they can regenerate multiple tissue types. There are two kinds of stem cells: embryonic stem cells that during embryonic development generate every type of cell in the human body, and adult stem cells that are tissue-specific, and unable to regenerate multiple tissue types. 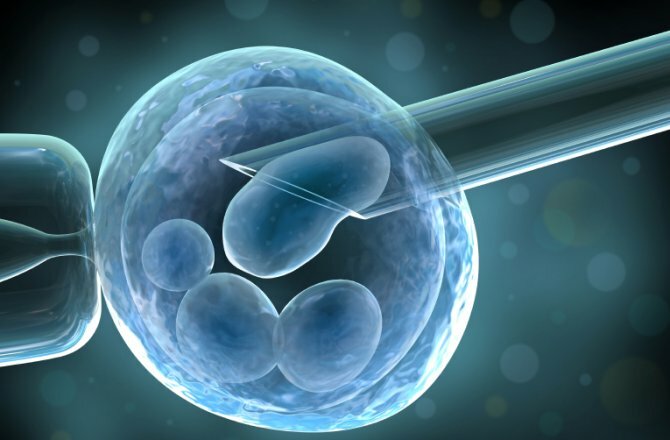 Embryonic stem cells would be preferable, save that they are prone to form teratomas (tumors composed of different tissue types), and their use is highly controversial. The method used by the researchers is, quite frankly, amazing. They took bone and fat cells in mice, switched off their memory, and transformed them into stem cells. To be specific, the technique involves extracting adult human fat cells and treating them with the compound 5-Azacytidine (AZA), along with platelet-derived growth factor-AB (PDGF-AB) for approximately two days. The cells are then treated with the growth factor alone for a further two to three weeks. 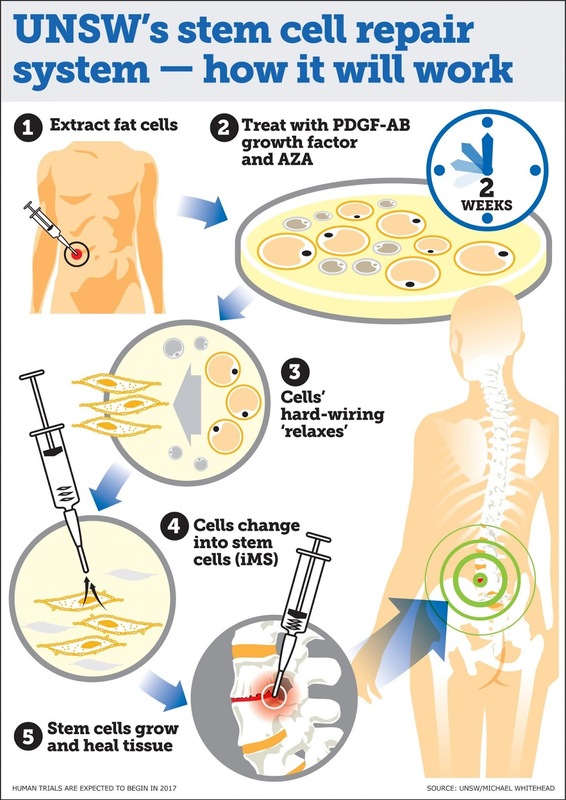 The current trials use iMS from adult human fat cells inserted into mice. Human trials for this technique are expected by late 2017.